Average Weight	: 26 - 40 lbs. In the ancient Gokstad excavation in Norway, where a Viking grave from about the year 900 was opened, skeletons from six dogs of various sizes were found. They turned out to be the representatives of modern-day Buhunds. When Vikings died, their most cherished and necessary possessions were buried alongside their owners. This was to care for the Vikings in their afterlife. These Buhunds, who protected farms (bu) and herded cattle and sheep, were expected to continue these duties in the afterlife. It has been documented that these dogs traveled with Vikings on their many journeys, by sea and by land. The more refined, beautiful type we see today was nurtured in the rainy western coastlands of Norway where it herded sheep and guarded farms. Due to the initiative of Norway's state-counsel John Saeland, the first Buhund show was held at Jaeren in the 1920s. The Norsk Buhundklubb was established in 1939. Toralf Raanaas was the first president. These men selected the very best for show, breeding and workability. Besides working ability, Buhunds are trained to aid the hearing handicapped, perform some types of police work, and score well in obedience and agility trials. In olden times they hunted bear and wolf. Today they work with livestock and guard home and family. The Buhund is considered by many researchers to be the easiest of the spitz breeds to train due to its innate desire to please plus its quick learning aptitude. Its spitz independence is an asset if it has to be left alone for a while. The Norwegian Buhund is a highly cheerful and active breed. They do not tire easily and require extensive exercise on a daily basis. The Norwegian Buhund needs to expel its energy and become destructive and ill-mannered if ignored or made to stay still frequently. In conjunction with their high level of activity and energy, they are also extremely lovable and are known for their love of children. However, due to their high level of energy and need for intensive training, Norwegian Buhunds should always be supervised, especially around children and the elderly. This breed loves to cuddle and give kisses to their masters and families. They form strong bonds with their owners and therefore are natural watch dogs. This can result in aloof behavior and wariness around strangers. However, the Norwegian Buhund is highly intelligent. They are communicative and brave, but rarely will snap or bite without provocation. However, not all dogs of this breed are steady; they are sometimes found to be nervous dogs. They can even have a suspicious nature about them. New owners may find this problematic, since the Norwegian Buhund may bark at each new alarming noise or movement. This breed is also extremely headstrong and demonstrates an intense desire to be taught and to learn new things. If appropriate stimulus is not made available, the breed may resort to destructive or inappropriate behavior. The Buhund breed does become bored easily and is known to become restless. A constant state of activity is required, attention, praise and new information. This breed is ideal for owners who can dedicate time to exercise and training. With this desire for activity and learning combined with a high level of energy, the Norwegian Buhund makes an excellent obedience and agility dog. People who live active lifestyles, or are seeking a dog with which they can become involved in dog sports, will appreciate the personality of the Norwegian Buhund. It is also an ideal dog for people who are athletic and desire a dog to go running, hiking or biking with. This breed makes an excellent companion for a sports enthusiast. There are some negative aspects of the temperament of the Norwegian Buhund. Those considering the breed should be aware that they can experience severe separation anxiety. If left alone for several hours they are known to destructively chew things and bark, often destroying furnishings and disrupting neighbors. Therefore, it is important for the owners of these dogs to be able to be home often enough so that this does not happen and to properly exercise their dog for two hours or so on a daily basis. The Norwegian Buhund is a working dog and will require a lot of time and attention, whether he intended to herd livestock or live a life of leisure as a family bet. The Norwegian Buhund has a short very easy care coat that does not tangle or mat when the dog sheds. This dog is a seasonal shedder and does need extra grooming during shedding season. This makes the grooming of the Norwegian Buhund very manageable. However, because of their shedding they do need to be brushed regularly and this of course would increase during the two shedding seasons. They should be brushed at a minimum of twice a week and that is not during the shedding seasons. The Norwegian Buhund is a working dog and therefore requires a lot of exercise. They need to be exercised daily. They love to play sports and go for long walks. Exercise needs to include mental stimulation as well. The dogs do love to run, but it is also important to incorporate games and tricks into the exercise routine as well. Off leash dog parks are an excellent place to allow the dog to socialize with other animals as well as to run and get rid of some energy. Norwegian Buhunds should have one hour of exercise at least twice daily. 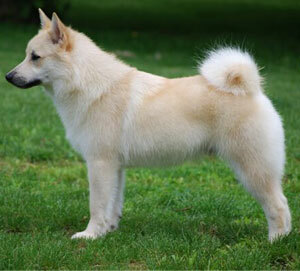 The Norwegian Buhund needs intensive and constant training from the time it is a puppy continued throughout its life. They are known to be somewhat sensitive dogs and therefore positive training techniques such as clicker training or food reinforcement training work best for this breed. The puppies should be introduced into training when they are about eight to twelve weeks of age. Having the puppy on a predictable schedule will make them feel more relaxed and loved. Proper crate training can also be useful. It is important to teach the puppy about keeping quiet in its crate at night as well as during the day time when there is no interaction. Between the ages of three and six months the dog should be learning to sit, lie down, stop barking when asked, walk well on a leash, and come when called. It is also helpful for the dog to learn to play games such as "find it" and "bring it" Games like these can be very useful with a Norwegian Buhund because it will keep the occupied while in the home. Between the ages of six and ten months the dog should be able to walk nicely on the leash, give you full attention when necessary, stay sitting when you walk away, play hide and seek with family members, and acknowledge names of family members. Simple tricks like "roll over" and "shake a paw" and many others can be taught during this age as well. The Norwegian Buhund does learn quickly and gets bored with repetition so keep teaching the dog new things when it is ready. It is also important for the dog to be socialized with people and other animals during its puppy stages so that it can learn to interact appropriately with both. The Norwegian Buhund needs to become familiar with interaction with people and animals so that it lessens the suspicion and likelihood of the dog reacting vocally to new stimuli.